The FolioMarketing module is an integrated and powerful marketing solution for Hedge Funds and Fund of Funds. The solution also contains full functionality to produce and distribute professional reporting to your investors or prospects. Create rich marketing and investor reports with corporate branding and data from FolioMetrics or other applications. Easily update content each month without redesigning reports. Create reports for multiple funds in one batch job. Manage email lists and effortlessly send emails to thousands of recipients. The integrated performance analytics platform also allows at a glance access to fund performance and statistics at any time such as during a phone call with a prospect or investor. By also subscribing to integrated third party data it is also easy to instantly view index data or analyse competitor’s performance. 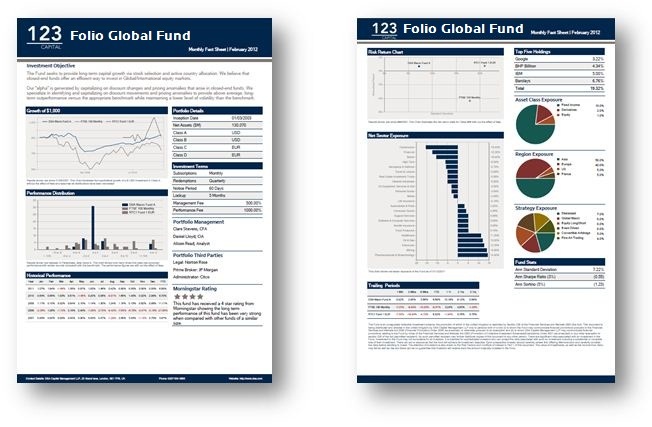 The Folio Investor Relations features mean that you also have full access to existing investor details such as a current investor’s balance or a fund breakdown by investor type or region.